Permit me at once to congratulate you on your election as President of this Assembly. As a member of the Caribbean community, The Bahamas takes special pride in the election of one of our region’s own - the third such person to be so elected over the years. Be assured, Mr. President, of our full support as you attend to the duties of the high office to which you have been elected and for which you are, if I may say so, superbly qualified. Mr. President : Permit me also to express my condolences and that of The Bahamas to the President and people of Kenya following the tragic attack on innocent civilians in Nairobi just last week. Mr. President: this year we in The Bahamas are celebrating our 40th year of Independence. It is appropriate, therefore, that we should pause today and look back to 1973 when our nation was founded and our membership of the United Nations began. 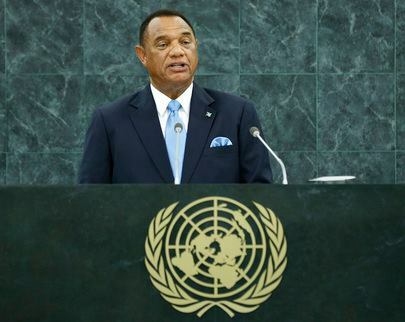 Sir Lynden’s call for us to be faithful to the responsibilities of our nationhood and world-citizenship is as relevant and compelling today as it was when we were welcomed into the family of the United Nations forty years ago. As the present Prime Minister of The Bahamas, I have therefore come here today, on behalf of the people of the Commonwealth of The Bahamas, to renew our pledge to play our part to help make our planet the place of peace and stability and of collaborative endeavour and mutual support that it was intended to be, and must be, for the good of all humankind. But we need to ensure that such pledges are not just so many catchy phrases. We need to not only talk the talk but walk the walk. We in The Bahamas are determined to do just that. That is why, to cite one very recent example, my Minister of Social Development, Melanie Griffin, on Tuesday of this week here in New York, signed the United Nations Convention on the Rights of the Disabled on behalf of The Bahamas. This is an important step forward that we have taken, marrying our rhetoric to our actions and syncing our domestic agenda to our international obligations. We intend to ratify this Convention in the shortest possible time. And we will introduce in our Parliament later this year the necessary legislation to protect the rights of the disabled and to give full effect to our obligations under the Convention. The end to discrimination against the disabled in our country is now clearly in sight. Indeed it is now imminent. Mr. President : I would also submit to you today that we are, all of us, under a moral obligation to ensure that the policies and aspirational goals which this august body sets for itself, and to which all member-states subscribe, are, in fact, reflected in the way that we govern our respective nations internally and, to no less a degree, in the way that we interact with each other as member-states in the international community. For example, we cannot, on the one hand, proclaim that we believe in free trade and then implement policies that inevitably bring about the destruction of agriculture as we know it in the Caribbean; and then, in response to the resulting moral outcry, simply shrug our shoulders and piously lament that ‘the old order changeth’. We have to become more conscious of the practical outcomes of what we do. Too many times, in the headlong rush for change, we damage the vulnerable and the weak. We then make pledges to help but seldom live up to those pledges in any sustained way. We simply cannot build a credible new world order on the basis of such practices. They run completely counter to our lofty pronouncements about the need for interconnectedness and mutual support in the pursuit of economic progress for all the nations of the world, be they large or small, and be they developed or developing. We see this same dynamic at work in the ongoing economic aggression of many of the more developed countries against small offshore financial service-based economies, especially in the Caribbean region of which The Bahamas is a part. Some have used their power either unilaterally or in small groups of high-powered nations to impose their will, arguing that there is something fundamentally immoral, something intrinsically sinister, about the accumulation of wealth in offshore jurisdictions. We reject that premise and we criticize in the strongest possible terms the efforts of some to maim and cripple, if not destroy, the offshore economies within our region. Ironically, the anti-money-laundering, anti-terrorism funding, and anti-criminal regulatory regimes of many of our counties are far more robust and demonstrably far more effective than the corresponding regulatory regimes in many of the same countries that are leading the fight against us. We firmly believe that offshore financial services can be responsibly operated and regulated. We believe that the sector represents true tax competition and, in the great majority of cases, it affords an honest opportunity for families and individuals alike to protect their privacy while accumulating lawfully earned capital for themselves and future generations. Moreover, the evidence is overwhelming that most of the investment of this offshore wealth takes place in, and generally benefits, the developed world. Unilateralism and diplomacy-by-coercion are not the way the world should be dealing with this issue. Instead we need to challenge the U.N to take the lead in developing and refining multilateral global mechanisms for the governance of the offshore financial services sector; mechanisms that will meet the legitimate demands of the developed world for the protection of their fiscal systems and their need for greater security while at the same time allowing offshore financial service economies to continue to grow in an orderly and properly regulated way. And let us not forget that the destruction of these offshore financial service economies will destabilize the countries that depend upon them for their livelihood. To destroy this sector in the Caribbean would effectively cause tens of thousands of newly empowered middle class citizens to slip back into poverty or to migrate to the developed world. The middle class of which I speak constitutes the anchor of social stability for the countries in our region. Take that away and social destabilization emerges as a risk of the most ominous kind. And should that risk materialize, the developed world may well end up finding that it has only solved one problem by creating an infinitely bigger one for itself. The need for greater multilateralism is also evident in many of the other problems confronting The Bahamas and our region. A matter of the highest national priority for us revolves around our ongoing problem with illegal migration to our shores. We, in The Bahamas, suffer from the illegal migration of tens of thousands of desperate people from our sister Caricom state of Haiti, an exodus driven by crushing poverty. We also have a problem with illegal migration from other countries in the Caribbean albeit to a much lesser extent. Of special note in this regard are migrants from Cuba. We believe that the policies, rooted in the Cold War, that largely account for this migration ought to be brought into alignment with the realities of the modern era. Our archipelagic nation, though comparatively small in population, covers a vast area. With our hundreds of islands, the opportunities for illegal migration are greatly multiplied. At a time when it is imperative that we invest in the education and health and future of my people, we are forced instead to devote an ever-growing share of our resources to the problems associated with illegal migration. The Bahamas, like the rest of the world, understandably places a great deal of emphasis on the human rights of migrants. We also believe, however, that there must be similar concerns for the ill-effects on migrant-receiving states such as ours. In particular, we are concerned about the increasingly unsustainable costs that are being incurred and the resulting erosion in the quality of life for the citizenry of The Bahamas. Our country simply does not have the financial resources and infrastructural capacity, much less the psychological stamina, to endure this dilemma indefinitely. This should also remind us of the economic disparities within our region, and of the need to intensify global efforts to eliminate poverty and structural imbalances that impede economic growth within certain sections of the Caribbean. As long as these disparities persist, illegal immigration to the shores of countries that are comparatively more prosperous will continue to grow. Mr. President : Another problem that is of special concern to us is the continuing influx of guns, and the increase in gun-related criminality, not only in The Bahamas but throughout the region. As a world community there is, I am convinced, a great deal more that we can and should be doing to fight this common menace. The Bahamas has this year signed the Arms Trade Treaty and we encourage all states that have not already done so to sign this Treaty as well. And to those countries that produce the guns that end up taking innocent lives and causing terror in our communities, we implore them to become more proactive in controlling the export of guns. We implore them to step up the policing of their own borders against arms traffickers. We therefore call for more robust surveillance and reconnaissance measures to be instituted. We already have the experience of the joint anti-drug operational activities with the United States of America. However, more resources ought to be employed in a region-wide effort to fight crime. In particular, we call for a massive increase in joint tactical operations so that more air and maritime assets can be consistently deployed so that the thousands of square miles that comprise the territorial waters of Caribbean states can be more effectively patrolled. We, in The Bahamas, stand ready to play our part in these joint efforts, without which the war on arms-trafficking, human smuggling and the transshipment of illicit drugs will never produce the victory we all strive for. Mr. President : In a recent talk that I gave to a meeting of the International Monetary Fund that The Bahamas hosted for the region, I made the point that we must all seek to mitigate the vulnerabilities of our small states in the Caricom region. Of particular concern in this regard, we have as yet been unable to disabuse the international financial organizations of their conviction that GDP per capita is by itself an accurate measure of the wealth of a nation or of its state of development. The result of the continuing adherence to this dogma, and the policies that have flowed from it, is that the international financial assistance needs of countries in our region are being erroneously assessed and misunderstood. I therefore call for a re-vamping of the criteria in this regard so that the true financial assistance and development needs of developing countries can be evaluated in a fairer, more balanced and pragmatic way. Mr. President: Another significant vulnerability for us concerns the environment and the need to address comprehensively issues of climate change. The Bahamas is surrounded by the sea and is low-lying. Indeed 80% of the land mass of The Bahamas is below five feet of sea level. The implications of climate change and associated rises in sea level are therefore obvious for us. I would submit that the world, particularly the developed world, has a stake in resolving this issue for while countries such as ours may be the victims of climate change, we are not among the countries that are, in fact, largely responsible for the climate change that threatens our future and that of the planet. Mr. President: In The Bahamas we are waging our own battles. We are putting our fiscal house in order. We are introducing innovative tools to battle crime. We are training a new generation for 21st century jobs. We are creating new partnerships to tackle our most pressing problems. We are aggressively pursuing renewable energy. We are revamping and modernizing our structure of governance to make it more responsive to the needs of the 21st century. And by the increased use of the referendum machinery, we are demonstrating our commitment to a deepening of our democracy. We are a small country with strong convictions and big ideas. But as we look beyond the borders of our nation and of the region to gaze upon the global scene, we see much eloquence and many handshakes and the ceremonial signing of one treaty after another. Rarely, however, do we see concrete steps, or enforcement mechanisms with teeth. Ringing declarations have been made, from Rio to Copenhagen and beyond, but we are constantly being challenged by our own citizens to demonstrate to them that real and measurable progress is being achieved at the global level. We need to see more courage, more leadership, more sustained action on the global stage. So as the leader of a small but proud nation, I say to the big and powerful nations: Find your courage. Because the hour grows late. Mr. President : I thank you for your kind indulgence.